Invisible to the eye, Fibromyalgia is a chronic disorder characterized by symptoms of widespread muscle, tendon, ligament and body pain often accompanied by tenderness in specific areas of the body known as tender points. 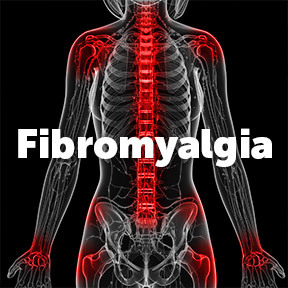 In many cases fibromyalgia may be initially misdiagnosed, as individuals generally experience a range of symptoms that can include joint stiffness, sleep disturbances, headaches, cognitive and memory issues, depression, irritable bowel, whole body fatigue and more. Lab tests are often used to rule out other possible co-existing conditions. Fibromyalgia can affect anyone. Yet, for unknown reasons most of those diagnosed with the disorder are adult women. Although fibromyalgia may be attributed to a number of factors, exact causes remain a mystery. The disorder is frequently attributed to traumatic events that can be physical, emotional or medical, such as a motor vehicle accident, a traumatic life event, or an illness or infection. Hormonal disturbances linked to chronic stress, and autoimmune diseases such as rheumatoid arthritis or lupus may also be contributing factors. Genetic mutations are believed to play a role, as those with a family history of the syndrome are at greater risk for developing the condition. Fibromyalgia is a life-altering centralized persistent pain state that varies in intensity from day to day. A multi-disciplinary team approach for the management and relief of symptoms is often recommended, as currently, underlying causes are not identified and addressed. As the body is designed to heal and health is the natural state, affected individuals must play an active role. Self-management strategies may help to reduce the frequency, duration and intensity of periodic flare-ups. Although fibromyalgia results in painful and uncomfortable symptoms, the condition is not life-threatening and doesn’t result in organ or muscle damage. Like the management of other chronic conditions, healthy daily lifestyle habits can help with symptom relief, minimize the impact on one’s life, and lower the risk for other health problems. Conventional approaches include medication, exercise and physical therapy. A more balanced approach includes complementary and alternative therapies. Supplements, along with lifestyle changes and other treatments, have been shown to help lessen pain, increase energy and promote healthier sleep. Pain relief: Take medications as prescribed. Over the counter pain relievers should only be used as needed for as short a time as possible. A long soak in the tub with added Epsom salts can help to reduce deep muscle pain and promote better sleep. Stress reduction: Focus on recognizing and reducing signs of stress, such as shoulder tension and headaches. Restorative yoga and meditation may help to lower stress and reduce pain. Physical activity: Due to pain and fatigue, many find it difficult to be physically active. Yet, research has shown that daily activity is one of the most effective treatments for fibromyalgia. Develop a low-impact exercise routine to help reduce pain, increase energy, reduce stress and aid more restful sleep. Walking and water aerobics for a short period a few days a week are good starting points. As pain decreases and energy increases, one may gradually increase frequency and intensity. Sleep management: Pain makes it difficult to get restful sleep, and lack of sleep can exacerbate symptoms. Getting sufficient sleep can help to ease pain and fatigue. Establish a healthy bedtime routine and avoid afternoon naps, as well coffee, alcohol and stimulating exercise within three hours of bedtime. Nutrition: A balanced healthy diet and proper nutrition supports energy production and good health, and reduces the risk of developing other chronic conditions. Although no specific diet for fibromyalgia has been identified certain dietary strategies, such as eating more plant foods, reducing animal foods, staying hydrated, and reducing sugar intake, support overall wellness. Fermented foods and foods rich in omega-3 fats and antioxidants can keep the digestive system on tract, and reduce inflammation and oxidative stress. Alternative therapies: Massage therapy, yoga, tai chi, acupuncture and chiropractic manipulation may be helpful to relieve pain, reduce stress, improve function and promote natural healing. D-ribose: D-ribose is a naturally occurring unique sugar used by all bodily cells to build energy. Well-tolerated in supplemental form, D-ribose has been shown to increase cellular energy synthesis in heart and skeletal tissue. A pilot study found that D-ribose significantly improved energy, sleep, mental clarity, pain intensity, and wellbeing in those with fibromyalgia and chronic fatigue syndrome. SAMe: Naturally produced by the body, SAMe boosts levels of serotonin and dopamine, which may help improve mood, and relieve pain, morning stiffness, and fatigue. Harvard Medical School researchers have found that SAMe is safe and effective for treating symptoms of mild depression. 5-HTP: This natural amino acid is used by the body to produce serotonin, a neurotransmitter that helps to regulate mood and behavior. Many individuals with fibromyalgia have low levels of serotonin. 5-HTP may have a positive effect on sleep, mood, anxiety, appetite, and pain sensation. Magnesium: Magnesium deficiency is linked to fibromyalgia symptoms. Maintaining therapeutic blood levels of magnesium is associated with a lessening of symptoms of depression, tender point soreness, and fatigue. Vitamin D: A review of published studies found that vitamin D levels may play a key role in the relationship between pain and sleep. Researchers theorize that vitamin D supplementation combined with good sleep hygiene could increase the effectiveness of pain management treatments in fibromyalgia and other pain related conditions. Adaptogenic herbs: Adaptogenic herbs such as ashwagandha and rhodiola help to improve metabolic and cognitive function, and defend against the negative consequences of stress by inhibiting the release of cortisol, a stress hormone. Corvalen® Ribose Chewable Tablets by Douglas Laboratories®: These all-natural D-ribose chewable tablets are clinically proven to help restore energy, support cardiac function, and reduce muscle stiffness, soreness, and fatigue. D-ribose helps to reduce energy loss in times of stress, and accelerates muscle and tissue recovery after exercise. Gluten, soy, wheat, dairy and artificial ingredient free, vegan formulation. 5-HTP 100 mg by Pure Encapsulations®: Clinically studied 5-HTP supports and encourages brain serotonin levels that can lead to positive effects on emotional wellbeing, appetite control, and wake/sleep cycles. Gluten and soy free, Non-GMO vegetarian formulation. Malic Acid + Magnesium Tablets by Douglas Laboratories®: This formula blends malic acid, a naturally occurring organic acid, with magnesium, vitamin C and bioflavonoids. These synergistic ingredients may have a beneficial effect on fibromyalgia symptoms, as well as the healthy structure and function of the immune and skeletal systems. Gluten, soy, dairy and artificial ingredient free. Bio-D-Mulsion Forte® by Biotics® Research: Designed to be helpful for those with absorption issues, this formula provides vitamin D3 in a highly bioavailable, micro-emulsified form for enhanced absorption and utilization. Gluten free. Bio-Adaptogen™ Ultra by Nutra BioGenesis®: This professional ayurvedic blend of adaptogenic herbs provides nutritive support during times of stress, and supports healthy adrenal function, optimal energy levels, and overall wellbeing. Magnesium Glycinate by Pure Encapsulations®: Important for numerous bodily functions, this product supplies highly bioavailable magnesium chelate along with vitamin C. Less likely to cause bowel discomfort than other forms of magnesium, magnesium in glycinate form provides support for neuromuscular and cardiac function, mood balance, and the proper metabolism and utilization of essential nutrients. Gluten and soy free, Non-GMO vegetarian formulation. This entry was posted in Home and tagged 5-HTP, 5-HTP 100 mg by Pure Encapsulations, Adaptogenic herbs, Alternative therapies, Bio-Adaptogen Ultra by Nutra BioGenesis, Bio-D-Mulsion Forte by Biotics Research, Corvalen Ribose Chewable Tablets by Douglas Laboratories, D-Ribose, fibromyalgia, Magnesium, Magnesium Glycinate by Pure Encapsulations, Malic Acid + Magnesium Tablets by Douglas Laboratories, Nutrition, Pain relief, Physical activity, SAMe, Sleep management, Stress reduction, Vitamin D. Bookmark the permalink.